The Bronco Nicotine Full Quill 11-inch tall men's Premium Collection cowboy boot features a smooth black leather upper with a bold silver stitch pattern. 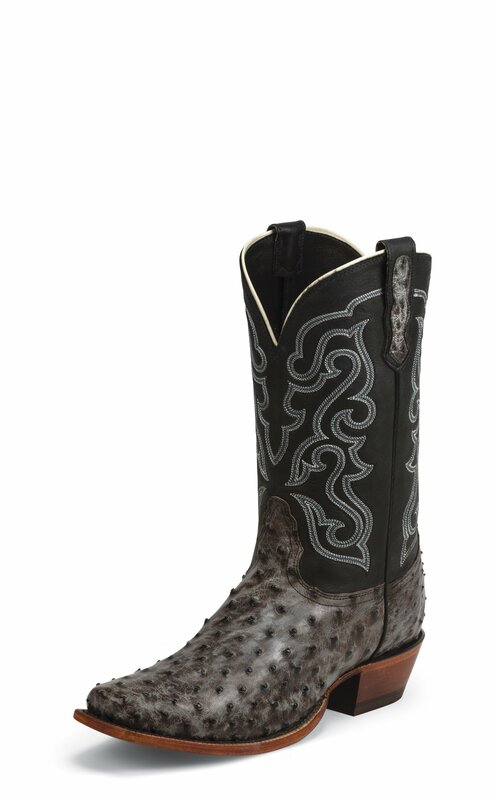 The charcoal and gray full quill ostrich foot is distressed for a lived in look and sports a half moon toe, 3/4 welt construction, and 1 1/2" underslung heel. Its cushioned insole provides lasting comfort in and out of the saddle. This style is proudly Made in the USA with global parts. I got these as my first pair of cowboy boots. A lady picked them out for me, I was shocked by the price but the boots are worth every penny. I can't wear these without someone saying something about them every time.